For the second big-screen adaptation of the Dr. Seuss classic, we head to 2018’s The Grinch. In a cave outside of Whoville, the Grinch (voiced by Benedict Cumberbatch) leads a largely isolated existence. One event particularly disturbs the Grinch’s solitude: Whoville’s increasingly large and loud holiday celebration. Determined to thwart the Whos’ plans, the Grinch decides to “steal” Christmas. 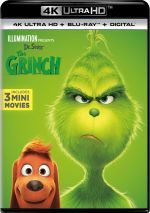 Like I noted above, this 2018 Grinch acts as the second cinematic rendition of Dr. Seuss’ tale, as it follows 2000’s live-action How the Grinch Stole Christmas. Of course, the most famous iteration remains the 1966 Chuck Jones/Boris Karloff animated classic. The 1966 TV special remains such a terrific version of the story that it causes one to wonder why Hollywood bothers to remake it. The answer would seem to be “$$$”, as both the 2000 and 2018 films raked in the bucks. Try as I might, I find it hard to figure out a reason the 2018 Grinch needs to exist beyond cold cash. While it provides a pleasant affair – and certainly improves mightily over the 2000 film – the 2018 flick never threatens to compete with the 1966 special. Like the 2000 movie, the 2018 Grinch needs to add character and story elements to expand to feature length. In both cases, much of the added material revolves around young Cindy-Lou Who. Though a minor character in the 1966 special, she gains a prominent role in the films. For the 2000 flick, Cindy-Lou found herself lacking in the usual Christmas spirit, whereas the 2018 Cindy-Lou (Cameron Seely) goes in the other direction. Obsessed with Christmas, she craves an audience with Santa, and when the Grinch impersonates St. Nick, their paths cross. Both films also provide backstory for the Grinch. Beyond an indication that he had a too-small heart, Dr. Seuss never attempted to explain the Grinch’s bitterness, but the movies feel the need to psychoanalyze our lead. The 2000 film related the Grinch’s anger and isolation related to the bullying and rejection he experienced as a child in Whoville. The 2018 tale follows a semi-similar path but shows that he lived as an orphan who felt especially alone at Christmas. The decision to humanize the Grinch didn’t work in 2000 and it doesn’t work now. For the Grinch to really evolve, we need to see him as a purely malevolent beast, one who acts out of straight malice. While the changes allow the movies to fill space, these choices damage the character. Because we feel compassion for the Grinch, we don’t see him as the nasty critter he needs to be, and his inevitable emotional evolution feels less impactful. We can see his deeper feelings so his switch at the end comes as less of a revelation. In addition, both flicks paint the Whos in a manner that harms the story. Dr. Seuss’ Whos existed largely in the abstract, as we knew them only as symbols of the holiday. Cindy-Lou was the only named Who and even she offered a small part in the overall tale. I don’t really mind the way the movies make Cindy-Lou into a major character, but the added time with the Whos damages the way we view them. In the book, we know little about them or their motives, so when they offer a pure celebration of Christmas at the end, we buy it. That doesn’t ring true for the Whos in the movies. As shown here, the Whos obsess over the commercial/showy side of Christmas so much that it feels tough to swallow that they’re A-OK when all their gewgaws go bye-bye. As much as these choices subvert the source and seem counterproductive, I do understand that they need to exist. Whereas the short novel could turn into a 26-minute TV special without much need for added material, an 86-minute movie requires a lot of extra beats to survive. Grinch probably works best if you never read the book or saw the 1966 special. The story and characters still seem flawed in the abstract, but they’re less problematic if you don’t know better. Even with these issues, Grinch still provides reasonable entertainment, and God knows it offers a massive step up over the 2000 version. Whereas Jim Carrey attempted to emulate Karloff’s performance as the TV Grinch, Cumberbatch wisely chooses to take the role on a different path. The 2018 Grinch offers a snarkier take on the character, and Cumberbatch’s vocals bring out that tone. Cumberbatch goes for a somewhat whiny, nasal vibe that suits the part and the movie’s feel. As Grinch’s overly friendly semi-neighbor Bricklebaum, Kenan Thompson delivers a surprisingly lively turn as well. Bricklebaum gets little to do other than annoy the Grinch with his unflappable happiness, but Thompson plays the part with such earnest zest that he amuses. Ultimately, Grinch becomes a serviceable and moderately enjoyable update on the story. Fans of the book and TV special will be as annoyed as I was by some of the changes, but the movie nonetheless brings a generally entertaining affair. 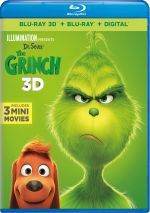 The Grinch appears in an aspect ratio of approximately 2.39:1 on this Blu-ray Disc. As I expected, the transfer looked terrific. Sharpness was fine across the board. Virtually no softness appeared, as the movie delivered satisfying definition. Grinch’s palette offered a general pastel tone, with some emphasis on blue and green as well as warmer pinks and reds for Whoville. The colors showed a good sense of vividness and worked well. With Grinch, we get a Dolby Atmos soundtrack. Downconverted to Dolby TrueHD 7.1, this mix offered a reasonably lively soundscape, especially during the action sequences. Those fleshed out the spectrum in an involving way and gave us nice activity and pizzazz. Music also became a strong partner, as the score and songs used the soundscape well. Add to that some localized speech and the soundfield added breadth to the experience. A staple of Illumination releases, the disc provides three Mini-Movies. We find Yellow Is the New Black (4:17), The Dog Days of Winter (4:04) and Santa’s Little Helpers (3:52). Usually these mini-movies focus on characters from the film featured on the disc, but “Black” and “Helpers” feature the Minions. “Days” uses Grinch’s pooch Max, so it manages to connect to Grinch. All three offer decent entertainment, with “Helpers” as the most fun of the bunch. To look behind the scenes, we go to Making of the Mini-Movies. This five-minute, 53-second clip features directors Fabian Polack, Derek Drymon, Bruno Chauffard, Habib Louati, Thierry Noblet, and Serguei Kouchnerov and Illumination founder/CEO Chris Meledandri. As expected, “Making” gives us a few nuggets about the mini-movies. It’s too short to tell us much but it offers some decent insights. From there we go to movie about the feature film, and we open with From Green to Screen, a six-minute, 19-second featurette. It offers notes from Meledandri, directors Scott Mosier and Yarrow Cheney, art director Colin Stimpson, modeling set supervisor Ludovic Ramiere, editor Chris Cartagena, and actors Rashida Jones and Benedict Cumberbatch. “Screen” looks at design choices, story/characters, cast and performances. A few minor notes emerge but this becomes a largely fluffy piece. With Illuminating The Grinch, we get a four-minute, 55-second reel with Meledandri, Cheney, computer graphics supervisors Laurent de la Chapelle and Fabien Polack, character effects Richard Adenot, animation directors Pierre Leduc and Christophe Delisle, and layout cinematography supervisor Guy-Laurent Homsy. “Illuminating” examines character design and animation. Though short, it gets into the topics fairly well. An interactive feature called Who’s Who in Whoville appears. It gives us info about Grinch, Cindy-Lou, Max, Fred, “Head Whos” and “Cindy-Lou’s Crew”. Across these, we can see “Character Profiles” as well as animation tests/walk cycles, progression reels and photo galleries. The “Profiles” offer short featurettes with info from Mosier, Meledandri, Cheney, Cumberbatch, Jones, and actors Cameron Seely, Scarlett Estevez andRamone Hamilton. The “Tests”/”Cycles” let us see various iterations of the characters, while the “Reels” show us the animation at four different stages. We get some good tidbits under the “Whoville” banner. Next comes My Earliest Grinch Memories, a three-minute, 10-second piece with Cumberbatch, Stimpson, Cheney, Jones, Meledandri, and Mosier. They offer personal histories with the characters as well as additional thoughts on the movie. Don’t expect much of interest here. During the three-minute, 21-second Grinchy Gadgets, we hear from Meledandri, Cheney, Mosier, Seely, Cumberbatch, Estevez, and Hamilton. They discuss the movie’s gizmos without much depth, so this turns into another fluffy reel. Two Lyric Videos follow: “You’re A Mean One, Mr. Grinch” (1:55) and “I Am the Grinch” (2:48). Both present the songs along with lyrics and unique animation. They’re forgettable. Songs from His Little Heart runs three minutes, 25 seconds and features Meledandri, Mosier, Cartagena, and composer Danny Elfman. As expected, “Heart” covers the movie’s music and tunes. It’s a serviceable overview. For a tutorial, we head to Any Who Can Draw. Hosted by head of story Mark O’Hare, we get taught how to draw the Grinch (3:05), Max (2:04) and Fred (2:11). These become fun lessons. With Xmas Around the World, we get a two-minute, 20-second clip. As one might anticipate, we find info about non-American holiday traditions. It comes with some good bits. Next we locate Cindy-Lou’s Yule Log. It fills eight minutes, two seconds and provides an animated fireplace with some Grinch dialogue and animation. It seems like a pleasant little diversion, if not anything memorable. Finally, Production Babies lasts one minute, 16 seconds and features O’Hare. He introduces a list of the children born during the film’s creation. It’s cute but not especially interesting if you weren’t part of the team. The disc opens with ads for The Secret Life of Pets 2, Johnny English Strikes Again, and Ugly Dolls. No trailed for Grinch appears here. 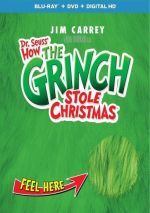 An update on the Dr. Seuss classic, The Grinch suffers from a mix of bad adaptation choices. Nonetheless, it offers reasonable entertainment in spite of itself. The Blu-ray boasts very good picture and audio along with a decent set of supplements. Grinch doesn’t compete with the TV classic but it’s still a moderately likable holiday tale.